Support the production and use of radioisotopes for a variety of industries. 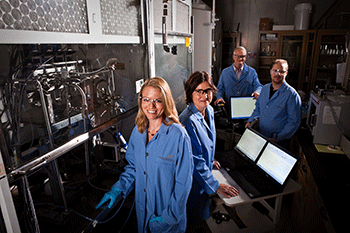 Develop capabilities focused on basic and applied research, isotope production, materials recovery and recycle, and client technical support. 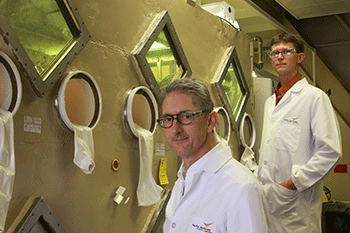 Provide cost-effective and timely solutions through advances in the production and use of radioisotopes for research, medicine, and industrial applications. Understand and model complex processes and interactions in a variety of subsurface environments. Couple processes involving multi-fluid flow, heat transport, geomechanics, and biogeochemistry to model subsurface flow and transport phenomena. Provide scientists and engineers from varied disciplines with multidimensional analysis capabilities that can be applied to unconventional hydrocarbon and energy development, geologic sequestration, and environmental remediation and stewardship. Developed and supported vadose zone remediation technology options including laboratory-and field-scale evaluation. Address computational demands of inverting large scale 3D and 4D subsurface data sets for subsurface imaging and monitoring. Develop a 3D modeling and inversion code designed specifically to run on Linux/Unix-based distributed-memory, parallel high-performance computing systems for subsurface imaging and monitoring using static and time-lapse 3D electrical resistivity or spectral induced polarization data. 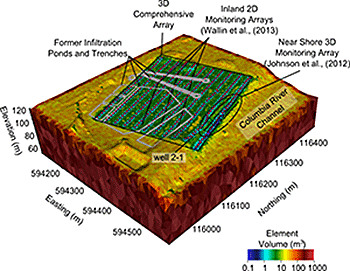 Provides open source 3D modeling software for subsurface imaging and monitoring that can be used to evaluate river bank storage, river intrusion, transport pathways, and influence of metallic structures (e.g., buried tanks or pipes). Understand controlling processes in the vadose zone to develop remediation strategies to achieve groundwater protection. Develop effective, technically defensible solutions for remediating, characterizing, monitoring, and predicting the behavior and fate of subsurface contaminants and liquid waste within the nation's nuclear weapons complexes. Provides critical scientific and technical underpinnings linking vadose zone and groundwater processes, contaminant nature and extent, and remedial processes necessary to conduct treatability tests, quantify how technologies change the site and contaminant conditions, and evaluate the performance of remediation options. Understand and predict the migration of contaminants in the subsurface, what happens to contaminants that are released from abandon mine lands, and which subsurface remediation options are viable. Provide a systems-based description of features, events, and processes that are collectively important to contaminant behavior, remedy performance, and control of exposure pathways. Enable defining path for remediation that maintains protectiveness, makes appropriate progress toward reducing future risk, and provides information to evaluate subsequent remedy actions or to support assessing the ability to reach restoration goals. Provide in-depth knowledge of ecosystem management that balances operational demands with effective stewardship of natural resources. Design sustainable hydropower systems that incorporate ecosystems-based management to predict and understand ecosystem impacts of hydropower development, especially for the salmon population in the Columbia River basin. Develop a salmon tracking system using an acoustic transmitter small enough for implantation in the smallest migratory individuals of the juvenile Chinook salmon and steelhead populations of the Columbia River basin to remotely track fish in one, two, and three dimensions with sub-meter accuracy. Monitor the behavior, movement, habitat use, and survival of juvenile salmonoids migrating from freshwater (through hydroelectric dams) into saltwater. 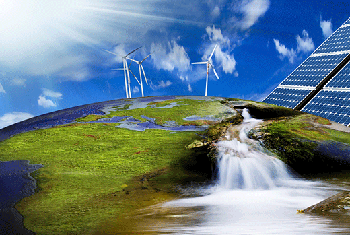 Evaluate and measure environmental impacts of renewable energy technologies to ensure that aquatic and avian animals, habitats, and ecosystem functions are not adversely affected, nor that important coastal and ocean uses are displaced. Draw together metadata, supporting reports, relevant papers, videos, and other material to provide a current state of knowledge of environmental effects of marine and hydrokinetic (MHK) and offshore wind energy developments. Cultivate a collaborative research space for the exchange of technical information on the effects of devices, moorings, anchors, and power cables on the marine and riverine environments. Performed diverse measurements of radioactive and nuclear materials including waste container characterization of all sizes from small vials to large cargo containers, assessment of material hold-up in process equipment such as glove boxes, fume hoods, pipelines, ductwork, plenums and high-efficiency particulate air filters, confirmation and verification measurements of special nuclear materials for safeguards proposes, quantification fissile materials for criticality safety purposes, and measurement of environmental media such as soil for characterization and scoping activities. 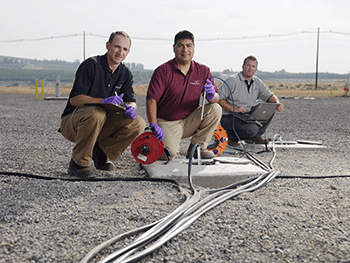 To determine radiation damage effects on hydraulic hoses to be utilized in high radiation fields in Hanford's Tank Farms. Using the 318 Building's High Exposure Facility (HEF), irradiate and pressure test various hose sizes and models to determine at what radiation dose they fail. Radiation dosage was from 400,000 R to 15,000,000 R. Based on this hose testing, the client can determine ahead of time which hydraulic hose material will last in a harsh radiation environment, avoiding costly equipment failures, shut downs, repairs, personnel exposure, and environmental concerns. Produce tools and conduct studies that will help the nation realize significant sustainable renewable energy from the nearshore and ocean environments. Many environmentally relevant decisions—from natural resource management to renewable portfolio standards—are made at spatial scales that are not well resolved in global models or without accounting for the full set of interactions among relevant human and natural systems. Uses a novel stakeholder engagement and uncertainty characterization process to simulate the complex interactions among climate, energy, water, land, and related systems at decision-relevant spatial scales. Allows decision makers to explore integrated energy-water-land impacts at regional scales and under different climate change/policy scenarios, leading to flexible models that can inform a variety of complex climate questions and reveal societal vulnerabilities. Identify tools water resource managers will call upon in the next five to ten years in the face of climate change and increasing development in watersheds. Couple the Distributed Hydrology Soil Vegetation Model (DHSVM) for watersheds with the Finite Volume Coastal Model (FVOM) for floodplains and estuaries through the Integrated Water Resource Modeling System (WRMS) to simulate development from the mountains, or "Snow Caps" to the estuary, or "White Caps". Examine specific changes in water budget, flood conditions, low flows, salt water intrusion, and land use management under various scenarios of climate change and changes in land use/land cover throughout a watershed system. Performing ground validation and ecological interpretation of analytical outputs. The relative amount and distribution of shrub canopy cover in rangelands is critical information for land managers, fire modelers, wildlife biologists, and ecologists, but determining the spatial extent and relative quantity of shrublands across the landscape can be very difficult. Utilize remote sensing data and imagery, along with ground data and spatial geographic information systems, to monitor changes in the type and quality of vegetation. 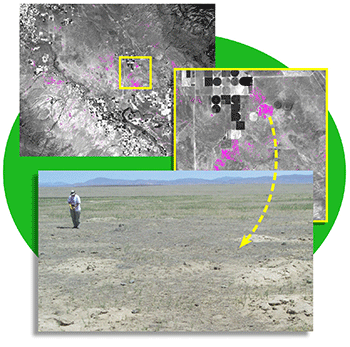 Provide promising tools and improve baseline and monitoring for rangeland assessments. 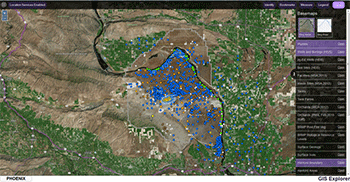 Access to environmental monitoring data poses many challenges to analysts, regulators and stakeholders attempting to efficiently use legacy data to support decision making at Hanford. Provide quick access to decades of valuable scientific data and insight through intuitive query, visualization, and analysis tools through spatially-enabled web applications. Streamlines investigative and analytical processes, saving time and money, integrates previously isolated datasets and develops relevant visualization and analysis tools, and enables discovery of new correlations hidden in legacy data, allowing users to more effectively address complex issues. Synthesize disparate data sets and information to collaborate with multiple stakeholder and user groups. Integrate custom and commercial operation systems and enhances collaboration through effective sharing of information. Improves testing and evaluation environments by facilitating an efficient delivery mechanism for decision-driven information to enhance collaboration and communication. 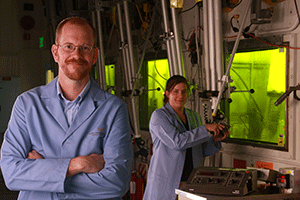 Optimize production of biofuels by marine algae. 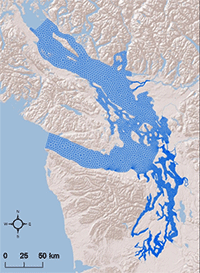 Coastal and estuarian systems in the Puget Sound are suffering impacts from climate change and coastal upwelling resulting in entry of low-dissolved oxygen (DO), high-pH, nutrient-rich water that is threatening the ecosystem. Develop a water-quality management tool that simulates tidal circulation, nutrient loading, transport and biogeochemical processes to help plan for future conditions. Provide an ocean modeling tool for coastal estuarine research, restoration planning, water-quality management, and assessment of climate change effects. Identified the need for a significant increase in eelgrass area for Puget Sound ecosystem health and a need to relocate sites where eelgrass is absent but habitat is suitable. Conduct 3D hydrodynamic modeling of Puget Sound to provide input to a dynamic eelgrass biomass model that uses light, water temperature, and salinity over time to predict eelgrass growth and perform test plantings and monitoring of sites identified as suitable for restoration. Identified suitability maps, ranked sites with eelgrass restoration potential for large-scale planting and evaluated field observations, monitoring data, outcomes of test plantings, and stakeholder input.